In India, every election is unique in its own way. Each can be called a trendsetter for future politics, although the reality is that an election often resets established political equations. Those who think that the Karnataka Assembly election, to be held on May 12, will set the tone for national politics are bound to be overwhelmed by the next set of political calculations that may emerge from the Assembly elections in Rajasthan, Chhattisgarh and Madhya Pradesh later in the year. With the Lok Sabha election still a year away, the state Assembly elections or by-elections can give political analysts a broad pointer to the emerging political contours. But its reliability would be highly suspect given the fact that the Indian electorate has over the years acquired the features of a flash mob. Take for instance a slogan that was coined after the BJP's drubbing in three by-elections in Rajasthan in February: "Rani teri khair nahin; Modi tumse bair nahin (The queen will not be spared although we have nothing against Modi)". Obviously, this slogan was not coined by any media consultant or expert in giving currency to catchy slogans. Far from it, it came impromptu from ordinary people using social media. Of course, the anger against Vasundhara Raje Scindia is quite palpable in Rajasthan. Similarly, in the Karnataka elections, many variables will be at play. The Congress made a smart move to fight the election on state-specific local issues, shifting the focus away from the personality of prime minister Narendra Modi. The shrewd politician that he is, chief minister Siddaramaiah had raised the issue of Kannada sub-nationalism by hoisting a separate flag for the state. He also granted the status of religious minority to the powerful Lingayat community, seeking to wean them away from the Hindutva fold. All this appears smart and sound — in theory. 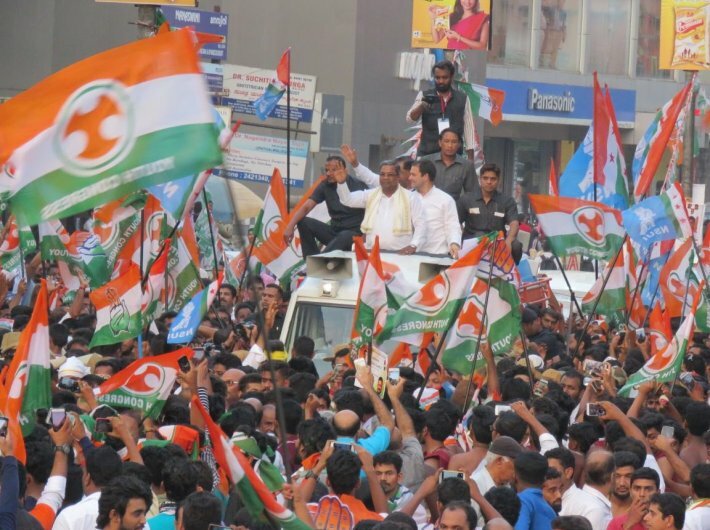 But there is little doubt that Siddaramaiah has been bearing the brunt of a very strong anti-incumbency mood in his state. Although he may be known as an astute politician, he is not regarded as a performer in the state. Besides deteriorating law and order, the state has been facing serious handicaps in building infrastructure. The lack of job-creation and extent of rural distress are quite evident when one travels in the state. Hence, Siddaramaiah's last ditch attempt to retain his turf is through the usual tactics of playing with emotions. Of course, emotions play a critical role in Indian politics. But rarely have they played a role in rescuing the fortunes of a losing leader. If Siddaramaiah emerges as an exception, he must thank his stars. But there is little doubt that he has muddied the Karnataka election waters so much that it has become difficult for political analysts to discern a clear trend. This handicap of political analysts does not apply to the electorate that may have taken a decision by now about the vote. The Karnataka election will be closely followed by crucial elections in Rajasthan, Madhya Pradesh and Chhattisgarh where the BJP has to defend its turf. And there are ample chances of the ruling party losing ground in Rajasthan and Madhya Pradesh should the electorate's disillusionment with their respective state government be taken as an index. In Madhya Pradesh, the stories of rural distress and corruption are being circulated furiously. And some of them carry an enormous amount of credibility as well. The anti-incumbency sentiment that the Raje government is facing was clearly reflected in the latest by-elections in the state. By all accounts, there are bound to be varied election results in the state Assemblies in the run-up to the Lok Sabha election. But it would be untenable to prepare a collage of the political landscape of 2019 election on the basis of conflicting results of these Assembly elections. In most of these states, the elections will be contested on the performance of local leaders. Most of the state Assembly elections or by-elections are fought on local issues that do not take the national scenario into consideration. Apparently, this is emphasised time and again in the political history of the country. For instance, in the 1960s, although the anti-Congressism had swept across the country dislodging the Congress from power in various states, Indira Gandhi won the 1971 Lok Sabha elections hands down. More recently, the BJP lost the 2012 UP Assembly elections abysmally even though in the Lok Sabha elections in 2014, the party and its ally won 73 out of the 80 seats. Despite the BJP's impressive show in Bihar, winning 31 of the 40 Lok Sabha seats along with its allies, it lost the state Assembly elections badly only a year later. The same story was repeated in Delhi, where the party won all seven seats in the Lok Sabha, only to face the most conclusive loss in the Assembly elections soon afterwards. The Lok Sabha election is a different ball game altogether. Unlike state Assembly elections where local issues will be at play, the Lok Sabha elections in 2019 will be dominated by a discourse in which Modi's persona will loom large. Modi's performance, credibility and his formidable skill at political management will be put to the test against his rivals whose possibility of coming together is still a story in the making. Given past experience, Modi has a unique ability to spin a powerful positive narrative out of most adverse situations. In a situation where the electorate often gets swayed by smart slogans and dumbing-down by social media, one year is a long, long time in politics.